Few tourists pass through the town of Chanderi, in spite of its 272 monuments. The simplest route to this remote hamlet is to alight at the nearest train station, Lalitpur, and drive 37 unwieldy kilometres from Uttar Pradesh into Madhya Pradesh. With roughly 30,000 inhabitants and a loom in almost every home (4,352 to be exact), unbeknownst to many, it is one of the most organised textile clusters in the country. The diaphanous fabric of the same name, widely used in saris, is still created in the centuries-old tradition. But the history of Chanderi is fraught with the same roadblocks that have been met with by other handmade textiles — from royal patronage to the threat of power looms as a result of the Industrial Revolution, cheap imposters flooding the market leading to a sharp dip in popularity and demand, a loss of livelihood for artisan families to being on the brink of disappearing altogether. Hope came in 2004, when the Chanderi sari was awarded a trademark by the Registrar of Geographical Indications in Chennai. This meant that only fabric produced within the confines of the town could carry the label. While it has not deterred the many machine-made versions that are still produced all over India, a slew of designers has championed the material by insisting on using nothing less than the real thing. “Weaving is literally the heartbeat of the town. The streets reverberate with the incessant sound of the khatka, creating a fine environment for design and creativity,” exclaims Samant Chauhan, who shot a documentary last year as part of the Road to Chanderi project. 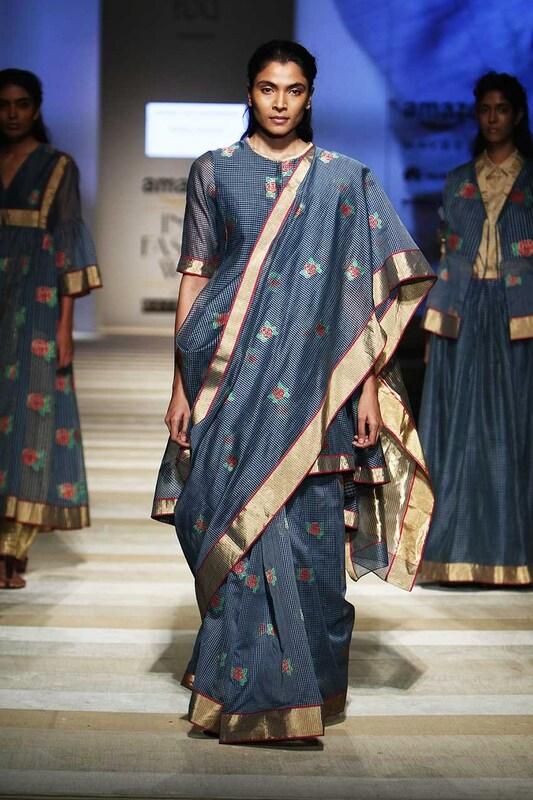 Commissioned by the FDCI along with Congress MP Jyotiraditya Scindia, it culminated in a runway show at Amazon India Fashion Week in October; yet another initiative to bring handlooms to the fore. Sixteen designers including Chauhan, Sanjay Garg, Gaurav Jai Gupta, Payal Pratap, Vaishali S and Aneeth Arora presented their interpretations of the fabric, showcasing its adaptability to a range of silhouettes. 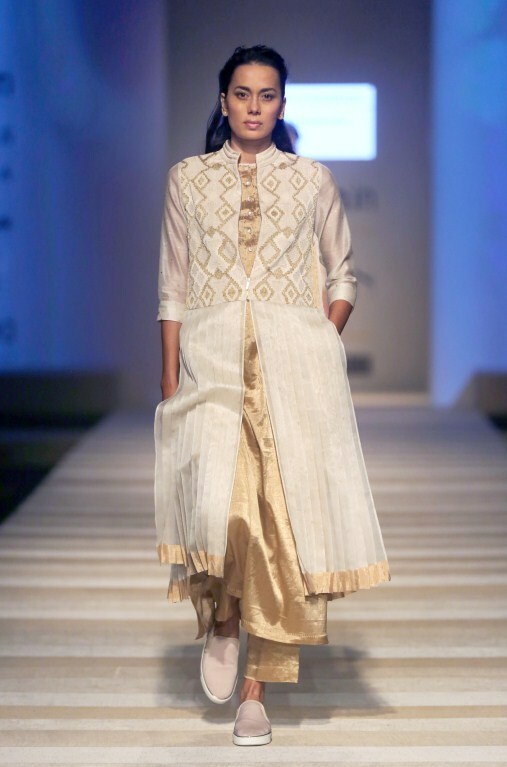 In recent years, Chanderi has inspired many a collection celebrating its “luminosity as well as fluidity, which makes it very versatile for draping and texturing,” explains Pratap, who uses it extensively in her designs. The lightweight, breathable weave is ideal for tropical climates, while its transparency and lustre allow for experimentation beyond the sari, adding a hint of richness to casual outfits and western cuts. “There is no divide between modern and traditional, it depends on how you use it. One can say that the material is so simplified and basic that it moulds into any kind of aesthetic,” declares Garg, a vocal handloom evangelist, who is wary of discussing trends and ‘it’ fabrics of the season. When he founded Raw Mango over eight years ago, he produced only Chanderi saris, but more recently expanded to tailored garments as well. Over the years, armed with the internet, artisans have learned to reach out to their customers directly, and this push and pull between craftsmen and clientele has taken quality Chanderi from high-end to high street; these days one can pick up a dress for about the same price as any synthetic, poly-blend outfit from Zara. Nicobar has been using it since its very first collection. 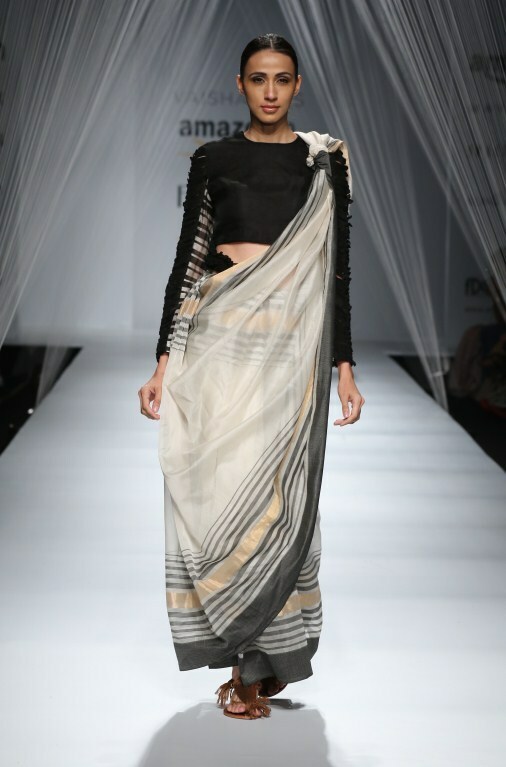 “It has a beautiful drape and we see no reason why it should be limited to a sari. We have used the understated richness of the fabric along with its flowy texture in more contemporary silhouettes. We love that it’s all-natural; that keeps our pieces airy, light and most importantly still Indian at the core,” says head of brand, Nirmal Kaur. As tastes shift towards natural fibres and homegrown labels, a new aesthetic is emerging that is most comfortable in a decidedly Indian skin. The secret to staying relevant for any heritage craft clearly lies in its ability to adapt to the times. Through a series of interventions, Raw Mango has introduced a number of new techniques, blends and colours to the mix, from which many designers have taken cues. Today, the brand employs about 450 looms, and Garg emphasises that “it doesn’t matter if we’re working for winter or summer, we have never left the loom. I do not source Chanderi, do embroidery over it and sell it. Everyone works directly with weavers, but value addition has to happen on the loom. Changing colours or patterns here and there doesn’t mean anything”. This article originally appeared in Verve magazine, February 2017.